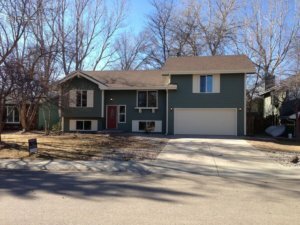 Brand new home in Central Fort Collins. All new: Kitchen with granite counters, refrigerator, dishwasher, microwave, windows and exterior doors, electric service breaker box, interior and exterior paint, wood flooring, carpet, lights, outlets, switches, fencing, garage door with openers. Locally made kitchen cabinets, custom tile back splash, two new bathrooms, all custom tile with new vanities.